Product description: Macro-synthetic fibres are 50mm long fibres that are sold by the kilogram with a dosage on average of between 5kg and 9kg per cubic metre of concrete. Each kilogram contains hundreds of thousands of individual fibres. The fibres are distributed into a concrete mix pre-pour and provide an exciting and easy alternative to traditional reo. Macro-synthetic fibres allow much higher dosage levels which results in concrete performance which extends beyond results achieved with tradition reinforcement. 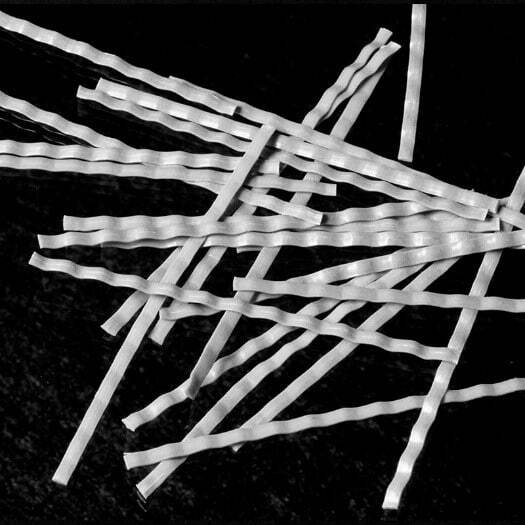 Macro-synthetic fibres are non-corrosive and can be considered as an alternative to both steel and steel fabric fibres. With an engineered contoured profile, the fibres are effectively anchored into the concrete thus reducing matrix pull-out and enhancing the concrete’s performance even after it has developed stress cracks.